Conor McGregor (21-3) will be fighting again for the first time since his pro boxing debut against Floyd Mayweater Jr, just over a year ago. The former 2-Division UFC Titleholder faces potential his toughest MMA opponent yet in Khabib Nurmagomedov (26-0). The bout is for the UFC Lightweight Title, which McGregor was stripped of earlier this year due to inactivity. But, there is more on the line this fight than just a championship belt. McGregor and Nurmagomedov have an open dislike for each other for years. 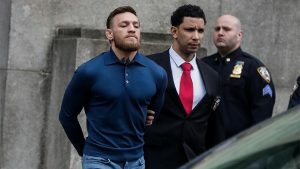 In April, McGregor flew from Ireland to the U.S. to hurl a handtruck through the window of Nurmagomedov’s bus, which was also carrying several other UFC fighters. The event was supposedly instigated by Khabib slapping a teammate of McGregor’s. 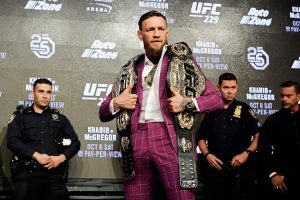 It was unclear for some time whether Conor McGregor would face legal ramifications preventing him from competing. Instead, he lives up to his nickname “Notorious” and has added fuel to the fire for this bout. Maybe he learned more than boxing moves last summer when he was studying Mayweather, who seems to know his way around a courtroom. The matchup between Conor McGregor and Khabib Nurmagomedov is a classic striker vs grappler, although both are well-rounded, high-level martial artists. Seven of McGregor’s nine wins in the UFC have come via knockout or technical knockout. He’s well known for his fan-friendly striking style. Nurmagomedov is noted to be a brutal grappler with a tough chin. Though many fight promotions are guilty of promoting main events as “The Best Fight in History,” this one does seem to have some serious potential. 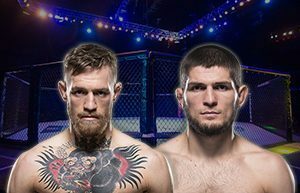 Conor McGregor vs Khabib Nurmagomedov is schedule as the main event on UFC 229 at T-Mobile Arena in Las Vegas. The fight will be five – five-minute rounds for the UFC Lightweight Championship Title. Tickets to the event sold out in a just few hours. The rest of us will be watching it on Pay-Per-View.